Hennessy is partnering with rapper and painter A$AP Ferg to bring together three of the artist’s passions: music, art, and cognac into a one-of-a kind cocktail kit. 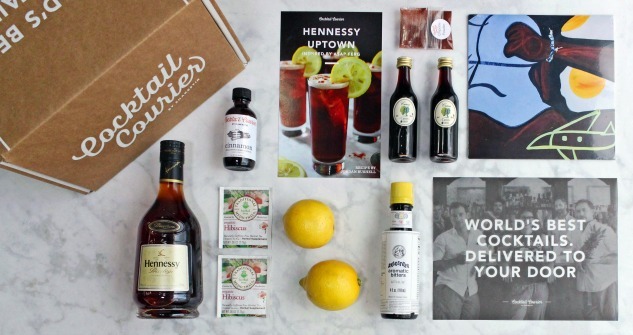 The kit, created by Cocktail Courier, contains everything you need to make the “Hennessy Uptown” a cocktail inspired by A$AP Ferg. The kit comes in at $78, and includes everything you need to make eight cocktails, including a bottle of Hennessy V.S.O.P Privilege. We wrote about Cocktail Courier last year. If you haven’t seen the kits, they’re pretty rad and worth checking out. Essentially, you get a box in the mail with everything you need to make a particular drink, including the booze. Drinks are a little more inventive than your standard rum and Coke, so you learn a little something with each box. Since they come with everything you need, you also don’t have to worry about picking up that one lime from the store, or springing for a huge bottle of bitters when all you really need is a dash. Think of it sort of like Blue Apron for cocktails. Everything is already in there, you just have to follow directions to make the deliciousness happen. In the case of the A$AP Ferg Cocktail Courier box, the first 100 people to buy it also score a limited-edition vinyl of Ferg’s “Family” track housed in a custom record sleeve depicting his artwork. Directions: Combine all ingredients in a shaker over ice and shake until chilled. Strain over ice into a Collins glass and garnish with a lemon wheel, a pinch of chipotle powder and a float of crème de cassis.